Hi lovelies! I have a bit of a different post for you all today. My idea for this post (or shall we make it a tag?) came from stalking myself on twitter and coming to the realisation that yes, I may be a blogger, but sometimes, just sometimes I should not be allowed on the internet. Which gave me the idea for this probably really strange post 'Times I've Failed At Internetting' (we're making it a word), so without rambling on too much, I'm just going to get right on into it and show/ tell my internet failures. First up is a story. A story of the search for my perfect blog name. Before Chloe's Way, I tried several different variations of my name with random words, Chloe's Blog (imaginative), Chloe's Closet (kid's tv show) and finally Chloe's Corner. I don't think this is valid anymore, but when I typed chloescorner.com into my little search bar, I was greeted with all kinds of naked. Not quite what I was going for when starting a fashion and beauty blog. I don't think the website is still live, but just in case I definitely do not suggest typing it in. Next, this update on my personal facebook page. 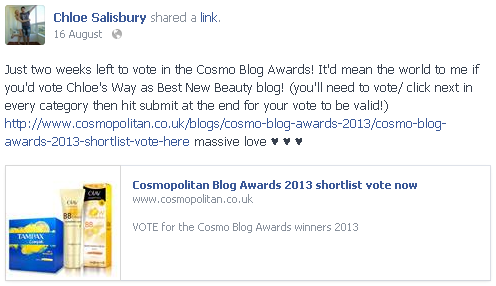 Not so bad, just sharing the Cosmo Blog Awards voting page, but wait, what's this? Oh, Chloe wasn't smart enough to change the thumbnail from a box of tampons. Not the worst thing ever, but definitely not the best thing to casually share on facebook. This is one of those ones that no one would notice unless I pointed it out, so, why not point it out? That's the smart thing to do. This is an old facebook profile picture of mine, not so bad. 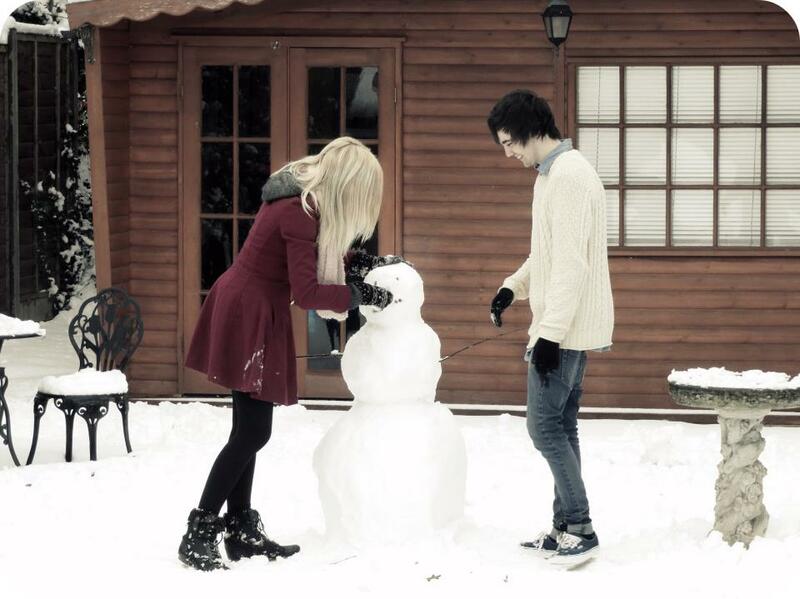 Until you look at where the snowmans arms are. Both sides. Maybe it's just my sense of humour though!! What does this even mean? I don't have anything to say about this, because I'm not sure what I even meant here. Next time 'friends', you take my phone AWAY. Not so much an internet fail, but a life fail. That I felt the need to share on the internet. Twitter does this to people! A reason why not to blog on your iPad, autocorrect is not your friend. This huge fail of a blog post label was on my recent post for Model's Own and Impulse with my poppy nail art design. Definitely not a puppy nail arm. Whatever that may be. So, this was a pretty pointless post, but I thought it'd be fun to share a few of the times I've done completely ridiculous things on the internet. How about you? Have you ever gone back and discovered something cringe-worthy that you didn't notice? I'd love to know! (so I don't feel so alone). So, if you decide to do this post, definitely let me know! This is such a great post I really enjoyed reading it, especially the pointless tweets! Haha this post is funny! I didn't think to do the search when looking for my blog name...Laura's Haven is fine but when it's written all in one go? It can be read as Laura Shaven. Awkward. Haha I love this post. I'm well known for my mis-types especially when my iPhone and ipad autocorrect are involved! I think I've failed at internetting on numerous occasions! I'm a new blog and just started today - if anyone was willing to, could you check out my blog. Oh my god! I love this post! I've never looked back on my timetable, maybe I should, see what gems I can uncover!